Gram Vikas is a rural development organisation that has been working with poor and marginalized rural communities in Orissa since 1979. Gram VikasÃ¢â‚¬â„¢ vision is: an equitable and sustainable society where people live in peace and with dignity. Gram VikasÃ¢â‚¬â„¢ mission is: To promote processes which are sustainable, socially inclusive and gender equitable, to enable critical masses of poor and marginalized rural people or communities to achieve a dignified quality of life. All programmes are guided by five core values: inclusion, social equity, gender equity, sustainability and cost sharing. In the early 90s Gram Vikas sought to uncover the root causes of poverty. It was found that ill health due to unsafe drinking water was a major cause of loss of productivity among adults and a leading cause of death among children under 5 and was thus one of the root causes of poverty. More than 80% of all rural morbidity is traceable to water borne diseases. This realisation led to the launch of the Rural Health and Environment Program (RHEP) in 1992, with a pilot intervention in 5 villages. The programme uses water and sanitation as the entry point activity to unite the community to take action to improve its well-being and environment. Before the programme begins in any village, the village must come to a consensus that all families, without exception, will participate. This brings the community together across barriers of caste, gender and economic status, which for centuries have excluded large sections of communities from the process of development. The village must also raise a corpus fund of Rs.1,000 ($22) per household with the better-off paying more and the poorer less. The corpus fund is an acid test, demonstrating that the community is committed to the process of development. Interest from the corpus fund is used to meet the social costs of extending the water and sanitation system to new households in the future, ensuring 100% coverage at all times. Gram Vikas has reached 22,347 households in 289 villages with a population of 124,148 across 17 districts of Orissa with water and sanitation. Water is pumped to an overhead water tank from sanitary dug wells where possible. In hilly areas, mountain streams and perrennial springs are tapped using the gravity flow technology to bring water to a habitation. The project will be executed in one phase. A village comes to a consensus such that all families of the community will participate in the programme after a process of dialogue and negotiations between Gram Vikas and the community that may take a few months to a few years. Once the community has agreed to undertake MANTRA, they plan how to form the corpus fund of Rs.1000 per household where the better-off pay more and the poorer less. Once the corpus is collected, the community together with Gram Vikas plans the construction of the toilets and bathrooms and also creates a plan for operations and maintenance (O&M) by identifying common resources such as horticulture plantations, forests or ponds for pisciculture that can be developed to meet all or part of the O&M costs once the system is commissioned. The community drives the implementation of the programme. The community makes the bricks and collects all the local materials necessary for construction like sand and rubble for foundations. Villagers construct the toilets and bathrooms led by trained masons. From each village, youth, both men and women, are trained in masonry during the preparatory phase of the programme. The landless, typically the poorest of the poor, are given priority. The masons are assured work for at least one year and a survey conducted by Gram Vikas found that masons trained under Gram Vikas are able to command significantly higher wages as skilled workers than they could as unskilled labour and also work more days of the year. The community builds the overhead water tank and lays the network of pipes. One or two village youth are trained as pump operators and to make repairs to the system that may be needed. This general body elects a Village Executive Committee (VEC), with 50% of the positions reserved for women, which is registered under Societies Registration Act, 1860. The VEC takes over responsibility for the project incrementally. Once the system is commissioned, the VEC ensures O&M systems are functioning including monthly household collections to meet electricity expenses for water pumping where electricity is used. The VEC also imposes a system of fines for open defecation anywhere near the village or unclean toilets to further ensure complete behaviour change. Gram Vikas is in constant dialogue with potential villages around those where it is already working and in new areas. Village selection largely depends on each villageÃ¢â‚¬â„¢s response and willingness to commit to the programme. The project can be implemented in almost any area and indeed Gram Vikas has implemented in extremely remote areas, inaccessible by road and unelectrified. Once a village is selected, a water source is identified. We have developed a gravity flow system to forgo the problem of water pumping in unelectrified villages where a suitable water source can be located in a nearby hill. The location of the toilets, bathrooms and water tower are done together with the villagers with the technical guidance of Gram Vikas staff. This includes people's contribution worth $27,273; resources accessed from the government worth $4,091; and other resources raised by Gram Vikas from other sources or from its own funds worth $41,932. The community contributes Rs. 1000 ($22) per family on an average upfront, which goes into a corpus fund. People contribute over 30% of the total costs of establishing the water supply system in the form of skilled and unskilled labour, locally available construction materials like bricks, sand, stones, chips and other aggregates. People also contribute over 50% of the costs of constructing toilets and bathing rooms - also in the form of skilled and unskilled labour and locally available construction materials. We appreciate the project community led water and sanitation system in rural Orissa. The strategy is well planned which covers all the issues and aspects required for the successful implementation of the activity. Regarding trainings , we would like to know more about the trainings modules, monitoring etc. which can add to our learning process. Mr. Thomas, thanks for your question. As a part of this programme, Gram Vikas conducts health awareness camps, other motivation meetings and a host of trainings in issues like gender sensitisation, grassroots leadership, local governance, livelihoods enhancement etc. Skill development trinings are also conducted for unskilled landless youth so that they graduate to highly paid masons within a period of two years or less. For these skill trainings, our staff along with the village committee come up with a list of boys and girls who are in need and are interested in such a training. Every staff looks after three to four villages. He/she is reponsible for monitoring the programme in the initial stages. We keep track of the progress through a Monthly Progress Report - a data sheet which keeps track of key monitoring indicators on a monthly basis. Monitoring at the village level is gradually handed over the women's SHGs and the different sub-committees of the Village Committee. Along with monitoring proper use and maintenance of the water supply and sanitation systems, we also monitor key indicators in education and health closely. Please revert to us through this forum or on email in case you need more detailed information. Please expand on the toilet type and installation - do the villagers have some corner of the property on which something is constructed? 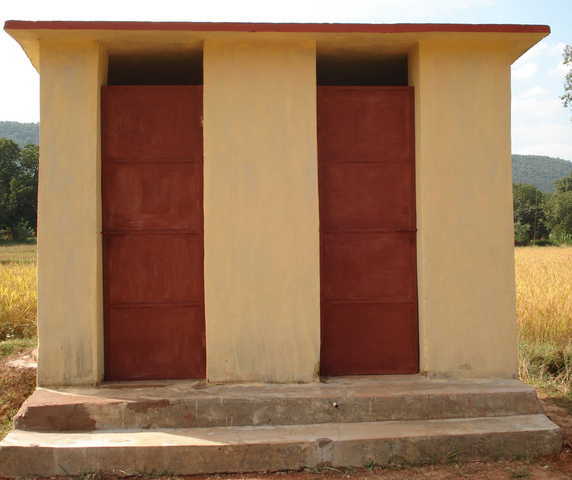 Or is it more community type of latrines? While BPR funds are not requested for the sanitation component, the entire project has to be clear to see its success chances and what learnings we can get from it. People mostly have a small plot of land adequate to build a toilet. In case they dont have any, there are negotiations at the community land to make available the nearest possible plot - belonging either to a neighbour or to the community. The toilets are twin leach pit pour flush toilets. People mostly have a small plot of land adequate to build a toilet. In case they dont have any, there are negotiations at the community land to make available the nearest possible plot - belonging either to a neighbour or to the community. The toilets are twin leach pit pour flush toilets. We appreciate the community led water and sanitation system being implemented for the marginalised and poor rural communities involving each and every family in the village without exception. The people's contribution (over 30%), operational and maintenance charges through community assests created is remarkable. The strategy is well planned which covers all the issues and aspects required for the successful implementation. The project involves the community in more ways then one and especially impacts women and children. One word of caution is would the toilets pollute the groundwater especially with nitrate . This is of particular concern since groundwater seems to be the predominant source of drinking water. Another concern is the sustainability of bore wells. Hopefully they are replensihed enough and will not go dry as they have in many parts of Karnataka and Andhra.